I must admit that sometimes when I read, I feel very intelligent. Sometimes this is because of what I am reading. For example, when I read and enjoyed Dead Souls, I was pretty impressed with myself. Have you ever felt that way about a book? That it raised your library cred just a little bit? I admit that part of the reason Memoirs of an Anti-Semite appealed to me was because I thought it would raise my library cred and make me seem erudite and worldly and classy. It has all the criteria I look for in a "brainy book." An interesting title. An original premise. An eloquent voice. Memorable characters. Symbolism. It is definitely a library cred book. And, had I understood any of it, I would feel really smart right now. Have you ever read a book and felt wildly, completely lost? The kind of lost where you are frantically reading, hoping comprehension will dawn, but it does not? That is how this book felt for me. I must admit that I am not as intelligent a reader as I sometimes like to believe. 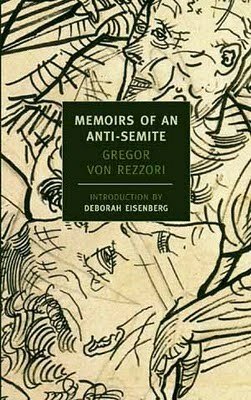 Memoirs of an Anti-Semite is a novel in "five psychologically fraught episodes" that meander through the narrator's life, starting just after WWI and ending in 1980. The narrator is from what used to be the Ottoman Empire but is now part of Austria. Each episode of the book centers around the narrator's relationship with someone Jewish or with the idea of "Jewishness." The narrator isn't a Nazi, but his casual comments about Jews and how different they are and how their "true nature" comes out make clear that he is anti-Semitic. I think that's all I can really describe of the story because it was seriously about five feet over my head. There was very little dialogue in the stories; mostly, we are inside the narrator's head and that is a very insecure and disturbing place to be. The writing is very engaging and von Rezzori has a talent for painting a vivid scene with his words. But there is just so much internal stuff and the paragraphs are so long and meandering that I often got lost and sometimes had no idea what I had just read. I feel like I concentrated very hard to read this book but still felt that I was sinking fast into a morass of confusion. I appreciated that the author wrote these stories from the perspective of a "normal person." The narrator is part of the faded gentry. You can see him become more nationalistic as he grows, and more set in his ways. Perhaps if the people around him had been different, or a few things had gone the other way, he would not have grown into the person he became. But... those were the people and experiences he had in his life. This book explored, subversively, just how Nazism could take hold to the extent it did. How? Because most people were too busy doing other things to notice just how much control the government had over their lives and thoughts. By the time the narrator woke up to the environment around him, he was so inured to it that he didn't find it extreme or frightening. My favorite chapter was the third one, which was originally published on its own in The New Yorker. It's called Troth and it follows the narrator through a deep friendship with a Jewish neighbor in the 1930s. He offers to marry this neighbor to save her from the Nazis, even as he makes clear he despises her religion and thinks her below him. Thus, we have the sticky and very dangerous situation of believing religion and class are intertwined. And yet, things come full circle. After the war, when the narrator is destitute and poor in the ruin that is Germany, his Jewish friend and her circle give him help in England, where they have gone and thrived. Just like Archie Bunker of All in the Family fame, the narrator of this story was "conventionally" racist and bigoted so that a discussion about important themes could ensue. I love that premise- taking hate, turning it on its head, and exploiting it to teach tolerance. And because I love the premise so much, I expended a lot of effort in reading this book. What do you do when you feel so strongly positive about a book's message, but just cannot get past the opaque language? Well, if you're me, you stubbornly refuse to give up and continue slogging in the quicksand. What can I say? That I recommend this book to really, really literarily intelligent people? Or that I think it's worth the trouble? I am happy I made it through to the end, though I admit to a strong feeling of not having got as much out of it as I was supposed to. It was difficult to read such dense internal monologue, though the parts I did understand were so, so good! This review is part of the Spotlight Series tour for NYRB Classics! See the full schedule here. Ha! I so know this feeling - the 'I-am-so-not-smart-enough' to get this book feeling! Good on you for finishing it though! Great review, and I get what you mean. I am sure I would have given up long long ago. I'm always pleased when I read something as a duty-read and find that I like it a lot - liking books I was dreading reading makes me feel my book cred has gone up. But yeah, it's a bit crushing to read a book and feel you are in over your head. To answer your first question, no there aren't really books that make me feel smarter when I read, or that make me look smarter. When I first started reading classics, it was because that was what was available to me and I enjoyed them. Before I began book blogging, I actually had people looking down on me because I read classics, thinking I was a snob when really I just had a lot of fun reading them. Crap. I meant to answer the second question too. Yes there have been books that go completely over my head and I admit, for the most part, I don't bother continuing to try to read and understand them. The one exception is Nabokov, who I will push for a decade on a book I can't understand just to eventually get through it. Last year, Jason read the entire collected major works of James Joyce. He read out pieces of Finnegan's Wake to me, which was literally like reading babbling nonsense. It was way over Jason's head, so much so that he read Skeleton Key to Finnegan's Wake at the same time. It took him 5 months to read through it. I know I never would have had the patience for that!! I tried to read The Yellow Wallpaper for a group discussion but was so not understanding it by about the fourth page. All my context was gone and I had no way to anchor myself. I feel that way about classics. I feel like if I read them it gives me cred, makes me look better, so I try to read them. I haven't read many, but hoping I will find some that I like more here soon. And yes, I do push myself to finish books. Especially non-fiction. Sometimes they end up dryer than I would like but I still want to finish them. This sounds like an interesting read. The premise of turning hate around to teach tolerance is an interesting one, I'm sorry to hear it wasn't a great read though. lol! I laugh because I know what you mean. I feel that way about Henry James. I didn't understand a word he said in Wings of the Dove but I slogged through because I didn't want him to beat me. Booklover- I could definitely see Rushdie having that effect! Marg- I'm glad I'm not alone! Blodeuedd- I would have, too, I admit, if it hadn't been for the Spotlight Series. Lizzy- Oh, I'm sure it could be good for you! I REALLY enjoyed the Troth chapter, and it kind of makes up for the difficulty I had with the rest of the book! Kals- Glad to be of service! Jenny- Yes, book cred is so vital to a reader, I feel! Or, at least to me. I think I probably lost some here, though. Amanda- Well, I think reading classics gives you book cred! To me, book snob = having book cred, even though I know that is a snobby comment to make. Also, Jason's quest to read Joyce will never cease to amaze me. Jodie- That story is MADE for discussion, I think! I was so freaked out by it. I *think* I understood it, but really... who knows. Amy- Yes, some classics are great! Others just don't work for me. And I know what you mean about non-fiction, too. Chris- Yes, it's all about the pride factor! That has definitely happened to me before! Sometimes in a minor way (as with Beatrice and Virgil by Yann Martel) where I just don't feel like I'm getting everything out of the book that others are, or in a major way (like Ulysses) where I'm completely lost and give up halfway through. For me it just depends on my level of comprehension and frustration as to how long I stick it out. Yep, I get that feeling sometimes, if it's a book that would be associated with academia or a study text for a degree etc, a book can have a tendency to make you feel that way, or at least that you're becoming more knowledgeable. But, like you say, understanding it is a different ball game. If you find you don't understand it that feeling of intelligence is replaced with one of feeling less intelligent than you actually are. Oh, I have definitely had this happen to me as well, and it's always frustrating. I think the last book to do this to me was The Master and Margarita, though there have been others. Judging from your review, you seemed to get a lot of it, and were able to express your opinions with a lot of insight, so it's not a total loss! Alyce- Yes, I think my decision to stick it out or give it up is different each time I make it. I think partly, I haven't abandoned a book yet this year, and I didn't want to start with one that I was reading for the Spotlight Series! Charlie- Yes, definitely! I felt quite low after this experience, but I feel certain someone else would really enjoy the book! Zibilee- Well, I'm glad that came through! I did get much from the stories themselves- it was the writing I didn't really like. Stu- Well, I will stay away from Zizek for a little while, at least, until I gain confidence again! I'm imagining that, if I ever finish it, War and Peace will raise my reading cred. But the fact that I've been stuck a third of the way through for six months is likely lowering right alongside: so I'll be lucky to end up with a wash! Eep - if it went over your head, it would surely go over mine too. I find that some books are really worth the extra effort (my recent adventures with Woolf come to mind as an example), but sometimes no matter how much of an effort I make I just can't get there, wherever "there" happens to be. There has been a book somewhat recently that I really did not understand titled St. Urbain's Horseman. After putting out a plea on my blog for someone to explain it, I just got a lot of people saying they would if they had read it, but now they won't because I made it sound boring. Oh no. If too much for you, it definitely is for me. I own a lot of books that I would feel all smart and superior if I read them but they sit on my shelves mocking me. Damn books, I'll show them! Oh I am so happy to know I am not the only one who reads books and thinks, man I am so accomplished for reading this and getting it (basically anything that has won a Man Booker or Orange Prize) and those prizes often do the same thing to me when I read the shortlisted books and don't get them. I am currently struggling with wondering why Wolf Hall is winning all those prizes. If a book was that far over my head, I would stop reading it (unless it's a bookclub book in which case I would try to struggle on with it). Life's too short, and there are so many good books out there. And er, I enjoyed Midnight's Children! Nymeth- Yes, I feel some books are definitely worth the trouble, but others just don't click for me. Jenn- Oh, no! Well, I suppose if it's a boring book, you saved people from it? bookmagic- I have no doubt you will win the battle against intimidating books! Amused- I admit I LOVED Wolf Hall, so I feel it was deserving, but I can also see how the pronoun usage could be very frustrating. I'm just a huge Mantel fangirl- have been since reading A Place of Greater Safety. Tracy- Not *because* they make you look intelligent, really. But having read and understood and enjoyed them makes you feel smart. At least, for me! I think I may have stopped with this one if I didn't feel compelled to read it for the series. I think that is the sign of a good book, any good novel - you learn something from it, usually something about yourself. Very funny and excellent post...lol. I'm thing we don't have to understand everything about every book we read. I sure don't... if I did I'm thinking I would be in some genius think tank pondering on the next stage of the planet. Hell I got through college on Shellie's skim and BS method of reading, writing and BSing about books in class. I'm sure there have been books that have made me feel this way but I just can't remember what they are at the moment. I must have blocked the memory of feeling a bit ignorant out of my mind! LOL! I so know the feeling Aarti! I must say you wrote an awesome and witty review! I am impressed! Shellie- Your method sounds failproof to me! I'll take it with me to grad school. I totally know what you mean about library cred books. I recently read "Everything Is Illuminated" and I kind of felt that way about it ... and I don't think it was nearly as tough a read as this. But I really don't think it helps an author or a reader if a book is so hard to understand!!! I don't think it makes you "not smart" but the writer "inaccessible." I have to give you credit for sticking it out til the end. Sounds like it could be interesting, but I don't like books that make me think really hard and I still don't get them! I'm afraid I don't make it far into books that I am not getting or that I feel are over my head. Not unless I am getting something out of them. I am sorry this one didn't work for you, Aarti. It sounded promising from the description. I appreciated the honesty of this review but it makes me sad to think that anyone would read a book for "cred" or for any reason having to do with what other people may think. I have always loved books and read them for what they bring to my life. I don't hesitate to put down a book for whatever reason. Many times I have persevered through "difficult" books but it is always because I was getting something out of it. As for the book in question, I thought it was outstanding. I found it very thought provoking. It summoned up all kinds of images in my mind. This is a mark of a great book. It's not always necessary to understand every little thing in a book in order to appreciate it. I think the reviewer made that clear also. I hIghly recommend this book. And please... read for yourselves not for "cred"!